Here at Ovarian Cancer Action, we’ve got nothing to hide. All your money goes back into doing the stuff that counts. The stuff that will make a difference. 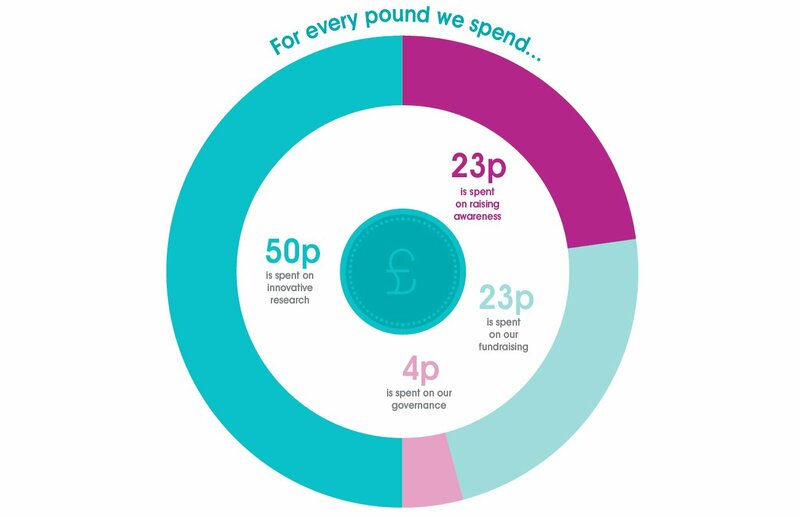 50p from every £1 you raise goes straight into our scientific research and 23p is spent on doing everything we can to shout about the signs and symptoms. Only 4p goes into governance and the rest goes back into fundraising. As they say, you have to speculate to accumulate. What could your money buy? £250 allows scientists to detect the number of copies of DNA in a tumour sample. You help raise the funds, here’s how we spend them. Take action in our t-shirts, running vests and cycle jerseys!